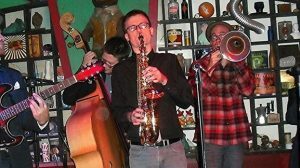 Kristian can be seen playing around St. Louis frequently with Tommy Halloran’s Guerilla Swing, The Dave Dickey Big Band and many other jazz groups. If you aren’t familiar with Kristian’s playing then you’ll definitely want to check him out on Tommy Halloran’s Gueilla Swing records. We are excited to present Kristian in a Jazz Quartet setting. He will be backed by some of the best local rhythm section players St Louis has to offer. Kristian will be joined by Eric Slaughter on guitar, Bob Deboo on Bass, and Kaleb Kirby on drums. You won’t want to miss this month’s showcase!! !